This, my third post on Latvia, looks at its recovery from the 2008-9 recession. Latvia is often held up as the "poster child" for harsh austerity measures as the means of returning to strong economic growth. In order to hold its currency peg to the Euro, it embarked on a brutal front-loaded fiscal consolidation in 2009, sacking public sector workers, slashing public sector salaries, cutting benefits and raising taxes. Between 2010 and 2013 it cut its fiscal deficit from 10% of GDP to a respectable 0.8%, a remarkable achievement by any standards. Much of this was due to an equally remarkable rebound in GDP. After experiencing the deepest recession in the Western world in 2009 and an IMF programme, Latvia emerged from recession in 2010 and thereafter grew strongly. By 2013, the IMF's chief economist Olivier Blanchard, who had criticised Latvia's decision not to devalue, was eating his words. Latvia was out of intensive care and well on the road to recovery. Austerians like to claim that Latvia's strong recovery was entirely due to its harsh austerity measures. But this, I fear, is the "post hoc ergo propter hoc" fallacy. Without adequate counterfactual evidence, we do not know what if any difference the fiscal consolidation made. 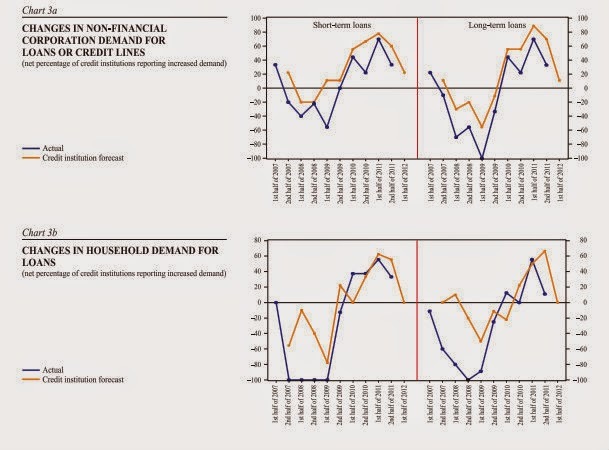 A higher non-financial corporations' demand for loans was mainly on account of rising fixed investment as well as inventory and current asset financing needs, while the driver behind the rising household demand for loans was their improved confidence. Bank expectations regarding the demand for loans in the second half of 2011 remained optimistic for both non-financial corporation and household segments, suggesting a positive outlook for further recovery of the economy. Blanchard, Griffiths and Gruss in their 2013 analysis of the Latvian miracle note that there was a large increase in productivity. They ascribe this primarily to labour shedding, and indeed Latvia's very high unemployment and high emigration rate support this argument. But increased investment also seems likely to be a contributory factor. But none of it lasted. The current account surplus quickly dissipated, leaving Latvia with a small but persistent external deficit. Industrial production declined in parallel. And the recovery in house prices was similarly short-lived. By the end of 2013, Latvia's GDP growth had sunk to just above zero. And there it has remained ever since. Latvia's remarkable recovery was in truth a "dead cat bounce". According to the survey results, the credit institutions' forecasts of July 2011 about a moderate easing of credit standards did not materialise. 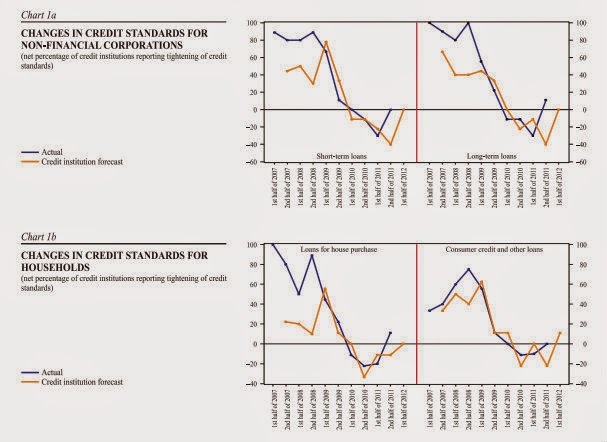 In the second half of 2011, credit standards of credit institutions remained broadly unchanged: in comparison with the previous half-year, the number of credit institutions reporting slightly easing credit standards contracted notably; moreover, some credit institutions even pointed to slightly tightened credit standards (see Charts 1a and 1b). It is noteworthy that for the first time since January 2010, not a single credit institution reported easing of lending standards with respect to loans to households for house purchase. What is particularly disappointing about this forecast is the expectation from banks that loan demand would fall. They knew that tightening credit standards would cause lending to decrease. And as we know that for small economies with limited access to capital markets it is bank lending that drives economic activity, the banks' forecast therefore amounts to a prediction of economic slowdown - caused by their own behaviour in tightening credit standards. Since then there has been no further relaxation of credit standards and no resurgence in loan demand. But why did banks start lending again so quickly after Latvia's collapse? And why did they then restrict credit? To explain this, we need to understand the nature of Latvia's banking sector. It is largely foreign-owned, mainly by Scandinavian banks. Of these, the most significant are Swedish banks. The Swedish bank bailout in 1992 has been widely admired as a model of how to deal with a banking crisis. Depositors and bondholders were protected, shareholders were diluted or wiped and banks were forcibly restructured, in some cases through nationalisation. Perhaps because of this swift and effective action by Swedish authorities, Swedish banks did not build up the dangerous leverage of other global banks. The market freeze in 2008 forced them to stop lending, and the falling value of Baltic real estate assets after the crisis damaged their balance sheets, but they recovered quickly and were soon able to commence lending again. Though they didn't have to lend in Latvia. So why did they? I think Latvia's fiscal consolidation played a part, not because it imparted confidence - though it may have done - but because the government's insistence on holding the currency peg to the Euro at all costs encouraged restoration of cross-border lending. Foreign banks could lend with impunity both in Euro and Lat because they knew the government would not devalue. So Latvia is indeed a poster child for the benefits of austerity in a fixed-currency regime, if what you want is restoration of foreign capital inflows after a sudden stop. 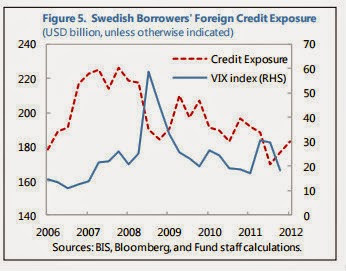 By 2012, Swedish bank lending to the Baltics had fallen from 11% of their total cross-border exposure to 8%. This is a larger fall than it appears, given that the banks were also reducing total cross-border exposures as a proportion of their balance sheets. The Baltics are small countries: this reduction is unquestionably significant. And for Latvia, the fall in corporate lending is particularly worrying, because that is what is really needed to generate long-term growth. To me, Latvia resembles a puppet whose strings are controlled by large Scandinavian banks. The 2004-8 boom was caused by excessive lending by Scandinavian banks: the "sudden stop" in 2009 was caused by the failure of Scandinavian banks:the short-lived recovery was driven by Scandinavian bank lending: and the present stagnation is due to credit rationing by Scandinavian banks. Latvia is not going to experience any further recovery while its financial sector remains dominated by foreign banks who don't want to lend cross-border. The Balkanisation of the European banking system has severe consequences for the Baltic states. Latvia has little or no control of its monetary conditions, and now it has joined the Euro it doesn't have much control of fiscal policy either. Its prosperity is entirely determined by the commercial interests of foreign banks and the attitude of their regulators. Is this really what the people of Latvia want? A classic Fisherian debt-deflation scenario, which could have been avoided by devaluation. "Between 2010 and 2013 it cut its fiscal deficit from 10% of GDP to a respectable 0.8%, a remarkable achievement by any standards." Yes,the fiscal adjustment was mainly in 2009. The fiscal DEFICIT vs GDP fell from 2010-13, largeIy due to the recovery in GDP. I evidently didn't make this clear. But the fiscal deficit vs GDP also fell in 2009, not compared with the previous year, but compared with what the deficit would have been in that year without any measures. I think that what they did in 2009 was the really remarkable achievement. I'm very sorry, Myskin, but that is not what Eurostat figures show. Latvia's fiscal deficit in 2009 was 9.8% of GDP. By 2013 it had fallen to 0.8% of GDP. Government spending fell by a considerable amount in 2009, but GDP fell by far more - hence the high deficit vs GDP. Unfortunately what the deficit. vs GDP "would have been" is the counterfactual evidence that I pointed out in the post we do not have. We simply do not know what the deficit vs GDP would have been, because we do not know what effect the front-loaded fiscal consolidation had on GDP. I am unimpressed with economists who claim to know what "would have been", even if they work for the IMF. Ok, I will not mention these numbers any-more (I think then we should also ignore anyone who tries to make a point by referring to something like the structural balance, which is heavily dependent on estimates of potential GDP). Anyway, the fact is that Latvia did more cutting in 2009, then in every single year between 2010 and 2013, probably more than in all those years combined. As you remark yourself, in the latter years much of the improvement of the fiscal deficit as a % of GDP was ´due to an equally remarkable rebound in GDP´. But that (the measures of 2009) is not something you can see by looking at the eurostat data you cite. But I don´t think we disagree on this. I've been very critical of people who use the "structural deficit" as an argument for austerity. The "structural balance" is voodoo economics. I certainly don't disagree that Latvia put itself through a wrenching fiscal adjustment in 2009. If I remember correctly, also Simon Wren-Lewis and Martin Wolf like to refer to the structural balance. Anyway, thank you for the discussion! The IMF's data is not up to date. Their figures for 2014 onwards are estimates. I do agree that Spain, Italy etc. are worse. But the tailing off of Latvia's recovery is in part due to their problems. The hard peg to the Euro meant that Latvia was not insulated from the Eurozone crisis. And the depreciation of the Euro is partly what has discouraged Swedish banks from lending. I will not to refute your argument; I agree with. But GDP data has shocked me a lot. Frances, what you are missing is that austerity rather than devaluation was politically popular. Even among the elements of society that were harmed the most. That was certainly my impression when I visited the Baltics in 2009. The reason why is that post Soviet collapse they had hyperinflation and devaluation - however bad austerity was - they wanted to move closer to Europe and the Euro. I live in Estonia and it is interesting to see how austerity is really popular here, among people with very different backgrounds. People here love to see themselves are hard and though, having lived through Soviet times and the economic collapse of the early nineties. The father of my girlfriend is a teacher and when in 2009 he had to accept a pay cut of 10%, he just shrugged his shoulders one time. Oh, I know austerity is popular. And bad though it was, this was nowhere near as much hardship as the end of the Soviet era. Latvia got its reward, too - joining the Euro was the whole reason for holding the currency peg and undergoing such a wrenching fiscal adjustment. There is lots of writing about austerity these days. I think there is vagary of wording confusing who gets the austerity. It seems often austerity for the government sector is implied to be austerity for private people (tax payers) and workers. The locals tell me the Latvian economy essentially hinges on Russian money laundering. Many oligarchs use Latvian banks as fronts. I suspect low oil prices had a knock on effect on Latvian capital flows for this reason. What do you mean by "By the end of 2013, Latvia's GDP growth had sunk to just above zero"? Latvia's GDP growth was 4.5% in 2013, which is NOT "just above zero". Annualised GDP growth in 2013 was 4.5%. But in fact growth fell sharply during 2013. The quarter-on-quarter growth rate fell from 2.4% in Q1 to 0.9% in Q4. It has never recovered. Latvian Statistical Bureau figures show that growth in 2014 was half what it was in 2013, and Q1 figures indicate a further fall. I am maybe overstating things in saying growth is "just above zero", but an annualised growth rate of 2% and falling is hardly robust growth for an emerging market economy that has recently suffered a very severe recession. Frances, are you sure you are not making a mistake? Unless I am misreading the statistics (I am not an economist), then according to the website of the Latvian statistical authorities, GDP did not fall sharply during 2013: Q1 growth was 3.1% and Q4 growth was 4.5% if you use the unadjusted figures; it was 5.9 (Q1) and 4.5% (Q4) if you use the seasonally adjusted figures. 2014 did slow down, but was 2.4% on an annual basis (2.5% seasonally adjusted), with Q1 and Q4 growth not that far apart, and certainly far from zero (2.8% vs 2.1% unadjusted, 2.3% vs 2.0% adjusted). Q1 2015 was 2.0%. Given the slow growth across Europe and worldwide in 2014, as well as the eruption of a mid-sized geopolitical crisis in Latvia's neighborhood (surely Ukraine that should have had a very negative impact on growth in Lativa?! ), it is not obvious to me that so terribly much faster growth should have been expected. What is your baseline? You've read the wrong line in the Latvian statistics. Your figures are from the line "% of corresponding period of previous year". Those are annualised figures, which I've already said don't tell you the intra-year trend because they include growth rates from the intervening quarters. The line "% of previous period" gives you the quarterly statistics, and as I said they show clearly growth had fallen sharply by the end of the year - to 0.8% quarter-on-quarter in Q4. I do not regard 2% growth as an acceptable rate for a country as poor as Latvia and as badly hit by the 2008 recession. It should be growing much faster. The last time it grew as slowly as this was during the 1998 Russian crisis - which was hardly a time of peace and prosperity. This is an awful indictment of the EU's policies in general and the behaviour of both the Latvian government and the Latvian banks in particular. I live in Latvia and doing research in participation within Latvia and Estonia. I am so pleased to see you highlight the culpability of Scandinavian banks. Their lending practices have been somewhat suspect, which helped to precipitate the crisis. Their interest rates were/are eye-wateringly high and not advertised up front. I am not sure that acceptance of austerity could be considered popular, more a resigned acceptance of what was considered inevitable. The people of the Baltics do not have a history of challenging authority within the general population. Neither can it be considered popular when so many people voted with their feet and left. It perpetuated the distrust of the population for their leaders too, especially when those at the top did not seem to suffer as much from the austerity. The politicians that implemented austerity were reelected, so austerity must have been ´popular´ among at least a significant part of the population. Same here in Estonia, the most pro-austerity parties won an absolute majority in 2011, a much better result than the previous elections. There is a difference between resignation and voting the same people again in power. I think that's a really important insight. The (considerable) emigration of the young and skilled since 2008 can indeed be seen as rejection of the prevailing political paradigm. I wonder if the willingness of older people to tolerate or even welcome severe hardship in the expectation that it will bring rewards is because they lived through the collapse of the Soviet command economy? They have experienced worse. And the 1992 recession did lead to a fast though unstable recovery. The reason for voting the same people into power again is undoubtedly because they have delivered the prize, which was admission to the Euro. Latvia´s government was reelected in 2010. It was only in June 2013 that the EU asserted that Latvia had met the convergence criteria and could join the euro. In 2010 and 2011 Latvia´s government deficit was still too high to qualify for membership. So delivering the prize could not have been a motive in 2010. For Estonia it seems more plausible. Estonia met the convergence criteria in 2010, and in 2011 the euro was introduced and the two pro austerity parties won an absolute majority. Ok. I thought the Latvian election was later. But in 2010 austerity was being promoted as THE way to secure lasting recovery. And the shadow of the Greek crisis was long. Latvia was not the only country to elect an austerity-minded government in 2010: my own country, the UK, did too. Also, Latvia was still being told by the EU to enact austerity in order to meet convergence criteria. And Latvia emerged from recession in 2010, which was widely regarded as proof that austerity worked. Given all of this, it is not surprising that the government was re-elected. I'd be really careful about interpreting migration as a "rejection of the prevailing political paradigm". You can migrate because you think that you have better opportunities abroad, while still believing (rightly or wrongly) that the choices of your home government are the best to take, given the menu of choices actually available. Indeed, if your government's choices make it easier for you to migrate -- and to move back in future -- you might well feel that the "prevailing political paradigm" not only is correct in the abstract, but serves you personally well. Incidentally, given your doubts about successive Latvian governments' choices being "what the Latvian people really want", what would you recommend that they do? Consider in all cases not only the economic but also the political ramifications of the choices, since these seem to be an important consideration to the Latvians (Russia!). Since the definition of GNP includes government spending it seems rather obvious that over the short term more spending makes the GNP go up and austerity makes the GNP go down. But over the longer term the bigger the government is the worse it is for the real economy. Look at Venezuela to see how lots of government spending ends up. http://www.howfiatdies.blogspot.com/2015/04/the-keynesian-economists-useless-task.html. 1) Austerity forced to do bunch of required structural reforms that clearly wouldn't have been done if devaluation was chosen. This is clear step forward sustainable economic growth and clearly not a case of "post hoc ergo propter hoc fallacy"
2) If you look at structure of recovery, I see no dead cats. It was driven by strong growth of exports and despite current troubles in Russia (one of the largest trading partners for Latvia) there still are positive dynamics and large input to productivity growth. What still lacks compared to pre crises period, is domestic consumption. But again given nature of consumption back then when it was fueled by cheap loans, now this is not a case. If suddenly domestic consumption would grow, this would have positive effect on GDP growth, yet imports would grow and we would witness unsustainable current account deficit.